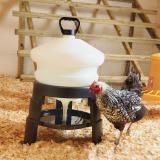 Tripod waterer with a deeper water pan that is more forgiving on uneven ground. 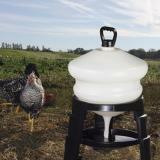 Suitable for poultry, game birds, ducks, geese and turkeys. 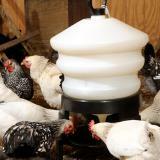 Ideal for any poultry producer with any flock size. Constructed of UV stabilized polypropylene and polyethylene. Has a solid tripod base, the body is light but durable with a heavy duty carrying handle. Filling the unit is done through the top of the tank. While filling, the spigot is sealed by a rubber key style bung. Once you place the tank onto the tripod, remove the bung, slacken the carry handle and let the pan fill. Once it covers the outlet pipe, tighten up the carrying handle creating a vacuum that controls the release of water as your birds drink. 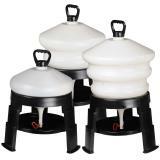 Replacement parts for Premier's Imperial Tri-Pod Poultry Waterers. Recommended: 5 out of 8 said they would recommend this product to a friend. It is built of thick plastic, but there are a few things that could/should be improved. The tray unsnaps from the legs easily when moving it around and the tray itself should be deeper than it is. It's "deep" tray is touted as a positive design feature (and it is), but it isn't near as deep as is implied. My other waterers have deeper trays. Also, the bung design is highly frustrating. It is not easy to get it in/out of the hole, making filling the waterer less than pleasant. You get used to it (and better at dealing with it), but it should be designed better (a ball valve would be a far better choice) --- even a rubber cap on the bottom would be a far better choice (if it would work reliably --- but my choice would be a ball valve). 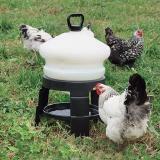 I will continue my search for a waterer that is better suited to frequent moves on uneven terrain. We pasture heritage turkeys and meat chickens. Over the years, we have tried many different waterers from a number if vendors. These days, like most everything else, red china makes the bulk of these waterers. However, the tripod waterers from Premier are made in England... a nice change. 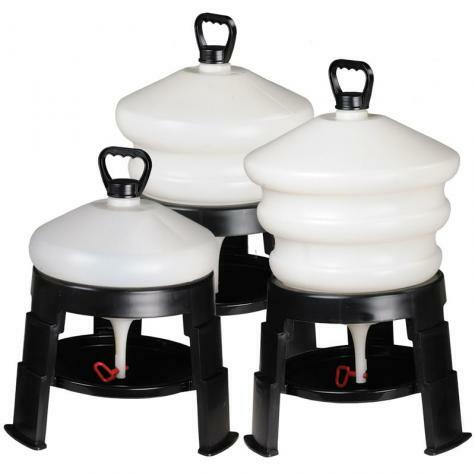 These waterers are more forgiving on uneven ground and are easy to clean. The lids seal great. Not a fan of the "plug" needed to refill, but it does work. In order to stop the growth of algae inside the tanks, we use various products. Once algae gets established, you will need to either clean the tank with chlorine bleach or pressure wash it. Not as good as advertised. The stand is a good height and very easy to clean. The water tank needs some revisions. It does indeed siphon back, sucking dirt and mud into the storage tank. (darn dirty duckies) The lid is so small you cannot get anything into the tank to clean it when it does get dirty. If the lid was say 4" instead of 1" you could get a spray nozzel and brush in there to clean it out a lot easier. The rubber plunger is virtually impossible for my kids to deal with. It isn't the easiest thing for me to install. The handle on the cap is nice and it does a good job of not spilling or overflowing. Seems like good heavy duty material that will hold up well the the NM sun. Change the cap geometry and I'd give it 5 stars. Bought the largest one,was my favorite waterer. owned for less than a year. October-July. Cant use during the winter months, so i got 4 months of use. The lid split, now it wont seal. Wish they sold replacement parts. i loved it because the water did not back syphon into the water storage. so the ducks with their dirty little beaks didnt ruin the whole jug.